Presenting the Buzz Box, the perfect accessory to the Buzz 4 stroller that accomodates all of your baby storage needs. The Buzz Box conveniently stores diapers and necessities won't interfere with steering or maneuvering. It easily attaches and stays in place with frame folded integrated rain shield, keeps valuables dry, and comes fully equipped with a changing mat. 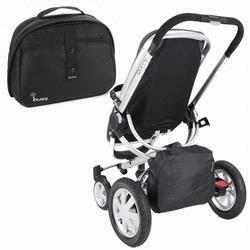 The perfect accessory for your Quinny Buzz 4 stroller.